Contributors. Preface—Christopher R. Cotter & David G. Robertson. Foreword. Before the 'After' in 'After World Religions': Wilfred Cantwell Smith on the Meaning and End of Religion.—James L. Cox. 1. Introduction: The ‘World Religions’ Paradigm in Contemporary Religious Studies—Christopher R. Cotter & David G. Robertson. PART I: SUBVERSIVE PEDAGOGIES: DATA AND METHODS. 2. The Problem of ‘Religions’: Teaching Against the Grain with ‘New Age Stuff’—Steven J. Sutcliffe. 3. ‘Not a Task for Amateurs’: Graduate Instructors and Critical Theory in the World Religions Classroom—Tara Baldrick-Morrone, Michael Graziano and Brad Stoddard. 4. The Critical Embrace: Teaching the World Religion Paradigm as Data—Steven Ramey. PART II: ALTERNATIVE PEDAGOGIES: POWER AND POLITICS. 5. Religion as Ideology: Recycled Culture vs. World Religions—Craig Martin. 6. Doing Things with ‘Religion’: A Discursive Approach in Rethinking the World Religions Paradigm—Teemu Taira. 7. Looking Back on the End of Religion: Opening Re Marx—Paul-Francois Tremlett. 8. The Sacred Alternative—Suzanne Owen. PART III: INNOVATIVE PEDAGOGIES: METHODS AND MEDIA. 9. The Desjardins Diet for World Religions Paradigm Loss—Michel Desjardins. 10. Narrating the USA’s Religious Pluralism: Escaping World Religions through Media—David W. McConeghy. 11. Archaeology and the 'World Religions' Paradigm: The European Neolithic, Religion, and Cultural Imperialism—Carole M. Cusack. 12. Complex Learning and the World Religions Paradigm: Teaching Religion in a Shifting Subject Landscape—Dominic Corrywright. Afterword: On Utility and Limits—Russell T. McCutcheon. Notes. Bibliography. Index. Christopher R. Cotter is Co-Editor-in-Chief of the Religious Studies Project and Co-Director of the Nonreligion and Secularity Research Network, as well as Honorary Treasurer of the British Association for the Study of Religions. David G. Robertson is Co-Editor-in-Chief of the Religious Studies Project and Bulletin Editor for the British Association for the Study of Religion. He teaches at the University of Edinburgh, UK. "This book will give a fresh impetus to debate in religious studies and religious education journals, and further volumes exploring the issues will appear as a result." "After World Religions offers practical guidance both for complicating the "World Religions" model in pedagogical contexts and for rethinking the introductory course altogether. 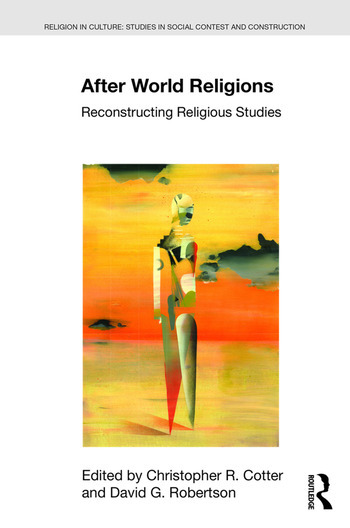 The chapters of After World Religions are an excellent tool box for those instructors (both young and old) looking to break out of what is increasingly regarded as a deeply problematic paradigm."